Indiana is in the happy position of being one of those states with too many movies to write about. To limit things a bit, I decided to write about Indiana sports films, because there are many. A couple of them aren’t just good sports movies but are great films. 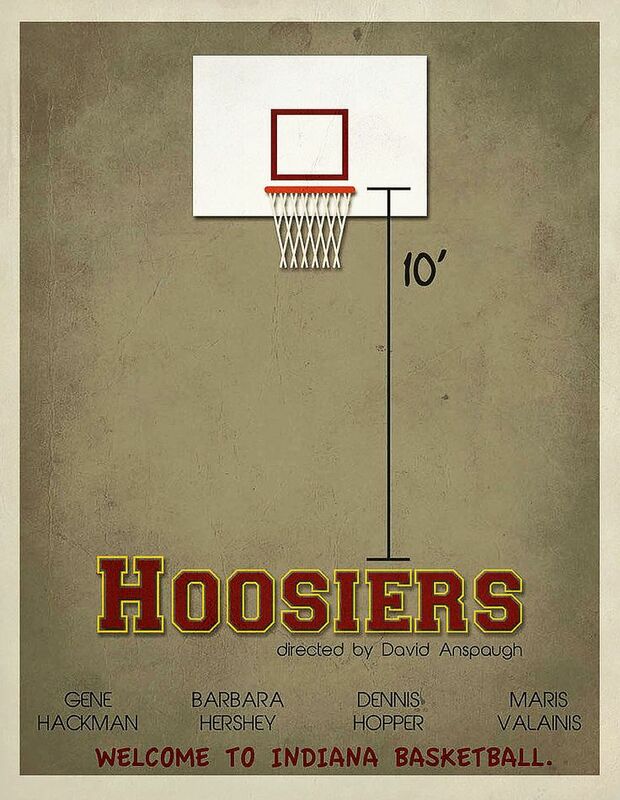 One of those films is 1986’s Hoosiers. Hoosiers is based on the true story of a high school basketball team in Milan (enrollment 161) which defeated Muncie Central (enrollment over 1,600) to win the state championship. The film, set in 1951, makes the school a little smaller, with a starting roster of 5 players. Gene Hackman plays a coach, Norman Dale, who comes to the small school for his last shot at redemption. Dennis Hopper plays the assistant coach, father of one of the players and an alcoholic. He was nominated for the best supporting actor Oscar for the film, and the film was also nominated for best musical score. The reverend also prays with the players before the games. Before the big game, he reminds the team that with God, they do not need multitudes. He tells them the story of David and Goliath. Strap (Scott Summers) prays a long time before every game, sometimes causing the coach to worry he’ll miss tip-off. And when there’s a town meeting to decide whether to keep or fire the coach… It’s held in a church. 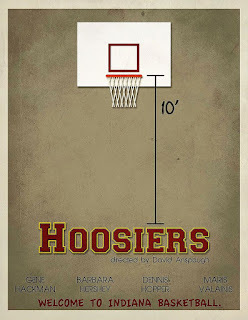 There are other basketball films set in Indiana. 1994’s Blue Chips, about college basketball,l was also filmed in the state. It was written by Ron Shelton (Bull Durham, Tin Cup) and directed by William Friedkin (The Exorcist, The French Connection). It also featured the “acting” debut of Shaquille O’Neal (so now you know who to blame for Kazaam and Steel). 2009’s The Winning Season about high school girl’s basketball was set in Indiana but filmed in New York. 2007’s Home of the Giants, about boy’s high school basketball, was filmed in North Carolina. The same writing (Angelo Pizzo) and directing (David Anspaugh) team that created Hoosiers worked to make a much beloved film about Notre Dame football, 1993’s Rudy. Also based on a true story, a hobbit -- I mean little guy -- (Sean Astin) dreams of playing college football and overcomes the odds. The film was made on location in Indiana. 1940’s Knute Rockne All American about the famed Notre Dame player and coach was filmed on a Hollywood studio, but it does feature future president Ronald Reagan saying the immortal line “Win one for the Gipper”. There are also a couple of great Indiana baseball films. 1992’s A League of Their Own, about the first female professional baseball league, features Geena Davis, Madonna, and Tom Hanks proclaiming “there’s no crying in baseball.” 1988’s Eight Men Out about the Chicago White Sox players who threw the 1919 World Series is, of course, not set in Indiana, but scenes were filmed at Bush Stadium in Indianapolis. The sport Indianapolis is probably most closely associated with is car racing, due to the Indianapolis 500. 1951’s Excuse My Dust is a Red Skelton comedy about the earliest days of auto racing. The film is set, but not filmed in Indiana. 2013’s Turbo is an animated film about a racing snail that is set (but obviously not filmed) in Indiana. But 1969’s Winning, starring Paul Newman as a race driver, was set and filmed at the actual Indianapolis Motor Speedway. There have been films set in Indiana about other kinds of racing, too. 2001’s Madison starring Jim Caviezel is about boat racing (it was partially filmed in Indiana). 1941’s Home in Indiana starring Walter Brennan is about horse racing (it was filmed in California, Ohio and Kentucky). 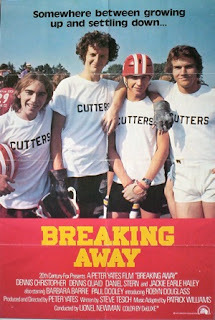 But the best Indiana racing film ever made is certainly about bicycle racing, 1979’s Breaking Away. It’s a coming of age comedy about a young man in love with bicycles and all things Italian, and it features the “Little Indy” bicycle race held at Indiana University in Bloomington. It was nominated for the Oscar for Best Picture and won the Oscar for Best Original Screenplay. The American Film Institute ranked it #8 among the most inspiring films. And like most of Indiana sports films, it’s just a lot of fun. All of these films make one want to be a “Hoosier” (whatever that word really means).